The California Myotis is one of the smallest bat species in BC it ranges from only 65-95 mm in length and weighs between 3.3g and 5.4g. Its fur colour varies from rusty to blackish brown and is dull in appearance. Its ears and its wing and tail membranes are black and the ears extend beyond the nose when pushed forward and have a long and narrow tragus. The length of the naked area on the snout is roughly equal to the width across the nostrils. The hind foot is small; the calcar has a prominent keel. The small, delicate skull has a steeply sloping forehead. This species uses rock crevices, tree cavities, spaces under the bark of trees, mine tunnels, buildings and bridges for summer day roosts. Small maternity colonies have been found in similar locations. 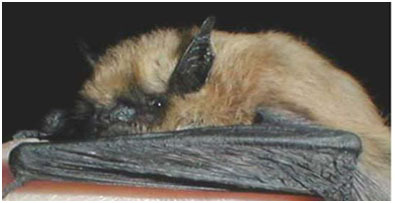 This bat is particularly flexible in its choice of night roosts and it will use almost any natural or man-made shelter. Males live separately from females in summer and often appear to change their roosting locations. There are two peaks in hunting activity: between 10:00 PM and 11:00 PM and between 1:00 AM and 2:00 AM. It hunts mostly over lakes near the surface, although this species will forage in the tree canopy, especially in poplar groves. Range: The range of the California Myotis extends from southern Mexico to British Columbia and southeastern Alaska. In British Columbia, it inhabits several coastal islands including Vancouver Island and the Queen Charlotte Islands, the coastal mainland north to the Bella Coola Valley, and the interior north to Wells Gray Provincial Park and east to Kootenay National Park. Habitat: In British Columbia, this species inhabits arid grasslands, humid coastal forests and montane forests. Its ranges in elevation from sea level on the coast to 1280 m in Glacier National Park.